Rumors about the brand new "headless iMac" has spread everywhere from CNN to NPR and of course the obvious rumor sites including thinksecret.com, appleturns.com, appleinsider.com, and macrumors.com. Reports say the headless iMac will sport a G4 processor with no monitor, thus drastically reducing the price. Don't believe those photos of the supposed iHome photos. The person who manipulated those photos used the wrong font! The Unlikely Moose has obtained a photo of the real headless iMac. It's minimal. It's striking. It's soooo Apple. How does Steve Jobs do it? Reports suggest the headless iMac runs the absolute bare minimum of processor, hard drive, motherboard, cd drive, RAM, and sound card. How minimum is minimum? Well, it won't have a processor, hard drive, motherboard, cd drive, RAM, or sound card. 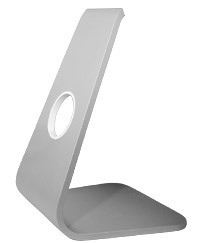 See, it's just the stand from the G5 iMac. And you baby-crying cheapskates should just buy a freakin' G5 iMac if you're looking for a great deal. Be happy with it.